Registry Repair is a powerful registry cleaning tool that performs comprehensive and deep analysis for Windows Registry, scans computer, cleans registry junks and fixes registry errors on invalid entries or references that can cause computer freezing, system crashes, instability, blue screen, as well as PC slowdowns. 1. The Above Yellow Area: shows the number of problems found and allows you to rescan registry for problems, as well as repair your registry on the invalid entries or references. 2. Left-hand Side Button: allows you to select the needed sections to scan. 3. 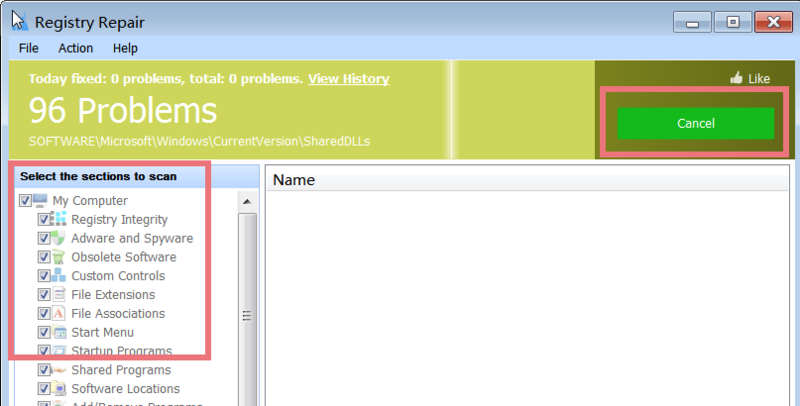 Right-hand Side box: displays the summary of problems found. For the one you do not want to repair, do not check it. Just choose the right one you need to repair, and click "Repair your registry" in the upper box of the main window. 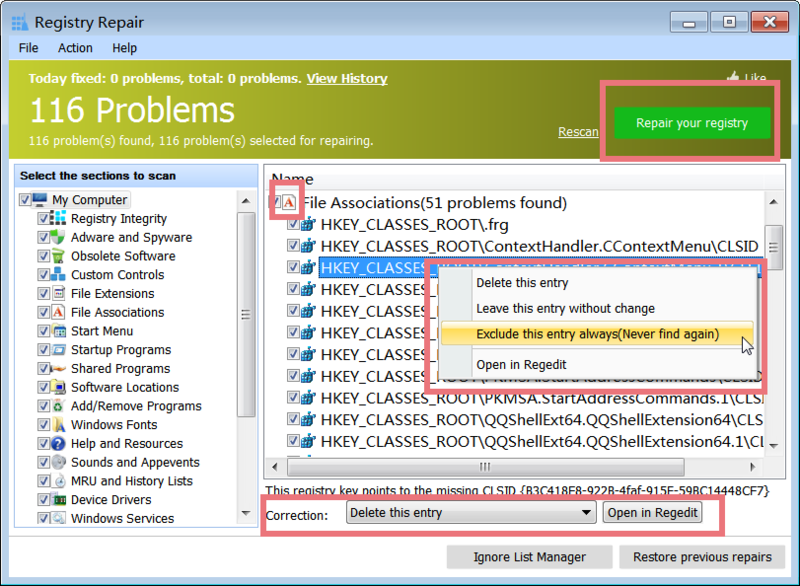 Registry Repair scans the entire Windows Registry deeply and provides comprehensive analysis. It detects all the registry problems caused by invalid Windows registry, obsolete software entries and dead file extensions. All you need to do is select registry sections that you want to scan. As soon as you start Register Repair, it will scan registry for problems. You can cancel the scanning process by pressing the "Cancel" Button. All this step will be finished within one minute and the Scan results will be displayed on this page. Part of Windows Registry will become invalid but still accumulate on your system, such as remnants of removed software and orphaned shortcuts to deleted folders. These invalid registry junks slows down computer performance and causes system freezing. Registry Repair scans Window registry and detects all these invalid registry entries. It does registry cleanup to lighten your Windows registry and speeds up your computer performance at peak. By default, all entries found are marked for deletion, since all found entries can be safely removed. If you are an expert, you can select those that you want to delete by check marking them. Incorrect operations may cause damaged registry entries and therein pop-up PC errors, blue screens and application failures. Registry Repair scans your computer and lists detected registry errors. You can delete a registry error, or leave it without change, or exclude it in future registry cleanup and repairs. To repair registry errors, a click on "Repair your registry" button is enough. 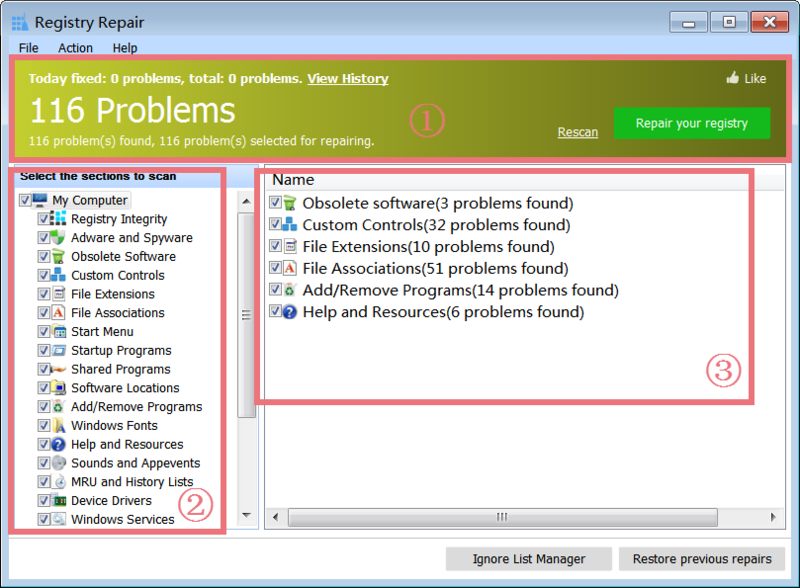 This registry cleaning tool will help you fix all these registry errors to keep your Windows Registry error-free. Registry cleanup and repair may cause instability or incompatibility problem to certain software updates. If you want to exclude an application from registry cleanup and repair, you can directly add it to the Ignore List. 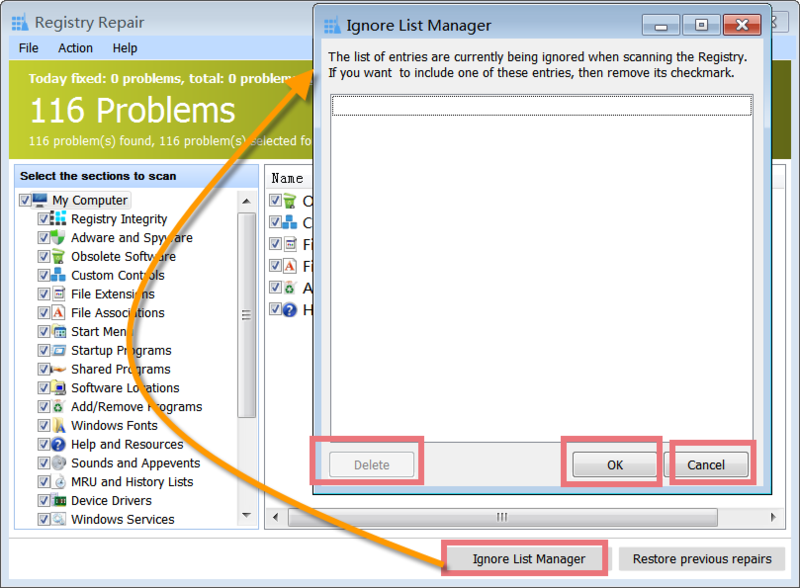 Applications included in Ignore List won't be scanned and changed during future scans when you are running Registry Repair. If the software update becomes more stable on performance, you can just remove it out of the Ignore List. Click "Ignore List Manager", find the needed entry, and then delete it. Whenever you clean the Registry, a corresponding Undo file is generated for any changes made. It can be used to recreate the deleted entries. 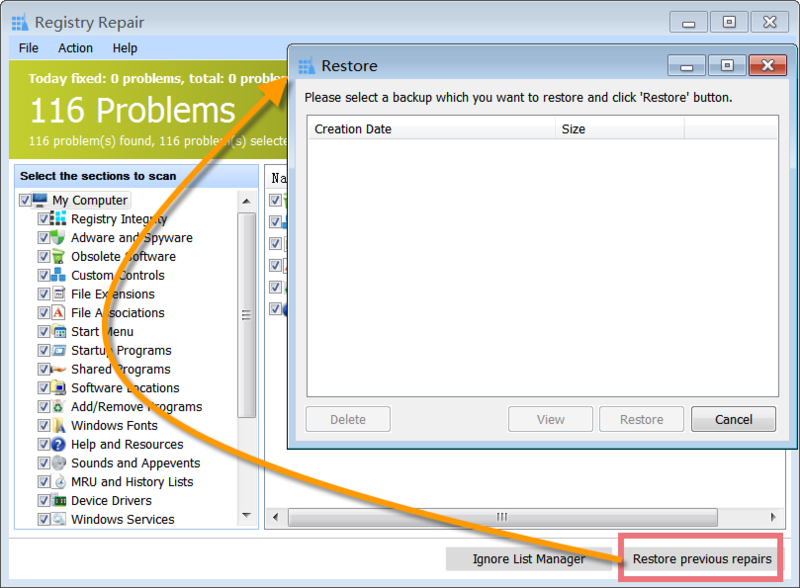 Click "Restore previous repairs", select the file to be merged back to the registry and click the Restore button. After scanning the registry, you can click the "Repair your registry" in the upper part of the main window. During this process, this cleaning tool will do the following: backup the registry and perform an action according to your selection. At the same time, by choosing "File -> Export ...", you can save the list as a text file before repairing. If you have problems repairing registry, you can find out the entry from export log, and then exclude it in future registry cleanup and repairs. Click "Repair" under Windows Registry, Registry Repair will pop up. Find and click Registry Repair icon in the Dock bar, Registry Repair will appear. If Registry Repair is not in the Dock bar, click in Dock bar, Registry Repair will show in a new popup window. Please note: if you want to add Registry Repair in the Dock bar, click in Dock bar, remove any icon by dragging it out of the Dock firstly, and then drag Registry Repair in.